Peace Mitchell and Katy Garner of The Women’s Business School have been named Women in Digital’s Best Incubator for Women Award winner. The awards were held at the W Hotel, Brisbane on Friday night 26 October where talented tech-savvy women from all over the country gathered to support, encourage and celebrate Australian women in digital. Peace Mitchell said she was excited to win in her category in the 2018 Women in Digital Awards against some of the big names of the Australian Incubator scene. “We’re passionate about supporting women and we were so excited to be recognised for this work! We believe investing in women is the key to changing the world and we’ve spent a lot of time listening to women and creating a unique program that really works for them. We know that women do business differently to men, they have a range of different challenges and have unique strengths such as creativity and intuition that we believe should be developed alongside more traditional business skills such as sales and marketing. We’re really doing something different to what other business incubators are and this award reflects that we’re on the right path.” Mitchell explains. “We were honoured just to be recognised as finalists alongside Muru-D and Fishburners which are amazing, high profile and well-known Australian incubators doing great work in the tech scene so being winners in such a competitive category is even more of an achievement.” Garner said. 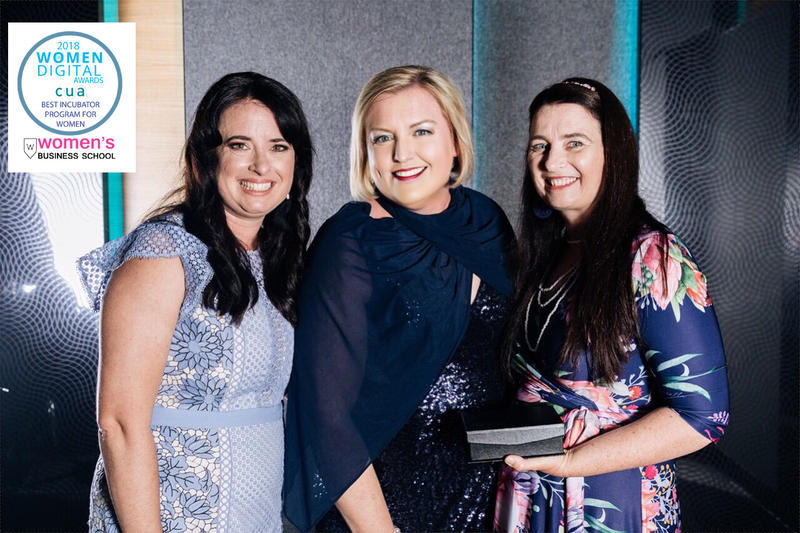 The Women in Digital Awards were created to support and celebrate Australian women leading the way in tech, Melissa Witheriff, Head of Digital Innovation at CUA who presented their Award explains. “I was blown away by the entrepreneurial spirit, resilience and professionalism of the award winners and I know that they will provide great inspiration for other women considering going into a tech field,” Witheriff said. The Women’s Business School is providing a much needed resource for women with the online entrepreneur community growing at lightning speed as women search for better flexibility, financial freedom and family time. The Women’s Business School co-founder Katy Garner said “We’re seeing more and more women who want to fulfil their entrepreneurial dreams as well as be hands-on mums and starting a digital business is one of the best ways to achieve this. The Women’s Business School recognised a need to support busy women to achieve their goals whilst managing their many other demands. “We are delighted that Peace and Katy of The Women’s Business School have won this award, they have created an outstanding program and are an inspirational role model and ambassador for women everywhere. The judges were impressed with their results and commitment to empowering women.” Women in Digital founder Holly Tattersall said.